Sorry, there are no shows on sale at Barbican Theatre right now. The nearest train station is York Station, located a 15 minute walk away from the venue. The York Barbican is located just outside the city walls, and is situated on Paragon Street. Paragon Street forms part of the city ring road, and is located at the south end of the city. The nearest bus stops are on Fishergate and Walmgate/Lawrence St, and York rail station is approximately 10-15 minutes' walk or a short bus ride on frequent service Red Line 7. A parking voucher for Q-Park Kent Street car park can be bought from our box office for the reduced York Barbican rate of £5.50, which is valid for the day of the event. Please park your car first before purchasing a ticket from our Box Office counter. The Box Office counter opens at 5pm on show nights and will stay open until the end of the interval. MAXIMUM VEHICLE HEIGHT - 2M There are 4 disabled parking bays for Blue Badge holders in Q-Park Kent Street which are available on a first come, first served basis on the day. For more information about the car park, please visit Q-Park's website www.q-park.co.uk or phone Q-Park on 01904 639040. The car park address is Kent Street, York, YO10 4AH. 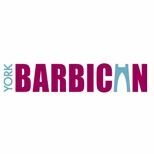 York Barbican has step-free access into the auditorium, meeting rooms, restaurants and bars. The first floor is accessible via a lift. Please see below for information about accessible seating in the auditorium. Wheelchair spaces are located on Balcony Level in the ?slips' and in Stalls on either row A or row AA, whichever is the front row. Level access seating is located on Balcony row A and Stalls rows A, AA and BB (where rows AA and BB are present). Each row B and above on both Stalls and Balcony involves 2 shallow steps. Priority Accessible Seats are available to book for those who require level access. These seats also have extra leg room and are suitable for those with assistance dogs or who normally require an aisle seat. Hearing and assistance dogs are welcome throughout the building and auditorium. Dog mats are available on request. Aisle seats can also be requested. The main entrance/Box Office entrance of York Barbican has level access from the piazza on Paragon Street. Disabled parking spaces are available at nearby Q-Park Kent Street The ground floor foyer spaces are all level access. There is a lift to the upper level (Balcony) of the Barbican. The lift has voice announcements and raised lettering on the control panel. All bars and the Box Office have low level counter positions. An accessible toilet is available on both floors of the Barbican.